For you, I dance the DANCE OF THE LEG BAND! Successful day today (..cross-step, kick, twirl..)! Late this morning, Mary and I kept an appointment to visit the Wacker nest. This was my first visit to Wacker this season, but Mary and Matt went a few weeks ago when the female was still brooding the eggs. During that visit, they both got a look at the adult male’s leg bands and identified him as Joe (b/g 59/H), the male from last year. The female absolutely refused to move from the scrape, so they were unable to get her bands and an egg count. Our favorite building engineer, Fred, called Mary last week to report the eggs had begun to hatch, so we were hopeful we’d have a better view of the nest’s occupants. We drove over with our windows down, enjoying the spectacular day, a rarity in Chicago this spring. 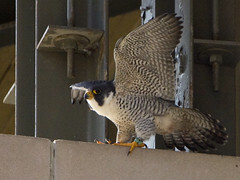 As we pulled into our parking spot on the top floor of the parking garage, I looked up and spotted an adult swooping in to land on the Wacker building’s nest ledge. Unfortunately, Fred had the late shift, so we didn’t get to see him this trip. Two other engineers met us in the lobby and took us “up top” to see the birds and then stayed around while we took a look. Like Fred, they were very interested and excited about their building’s rare occupants, so we happily filled them in on the nest’s long history. When we opened the door to the ledge, we saw an adult standing on the lip of the northern nest box. In front of her/him lay a huge pile of white fluff with three gaping beaks sticking out of it. Just as I was about to jot “3 chicks” in my notebook, a fourth beak emerged. Before easing out onto the ledge to get some shots of the chicks, I checked the skies, but the other adult appeared to be off on falcon errands. I have to admit, when I saw the adult and chicks, I assumed the adult was Rahn, largely because I took a picture of a very similar scene last year. The chick puff ball completely obscured the adult’s legs, so I had no way of verifying who the adult might be, but I snapped a number of shots while waiting for her/him to move. After about 15 minutes, the adult cocked her/his head and I heard the distant cry of another adult. Bonus! Maybe a minute later, the nest-guarding adult hopped off the nest and, still glaring at me, stalked to the edge of the ledge and took off into the air. I got a number of very clear shots and rolled back through the door to check them out. “Heeeeey, that wasn’t Rahn! That’s Joe!” I said, as I saw the bands in the picture clearly read 59/H. “Wait a few minutes and then check again. There’s obviously a nest switch happening.” Mary said. 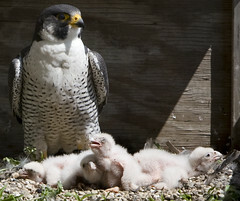 Indeed, a few minutes later I looked down the ledge at a buffier adult mantling protectively over the babies. As she gathered them up and scooted them under her, she gently preened their faces. I got a few quick glimpses at her bands, just enough to see they were black over green and 01/A – Rahn! Our job complete, we left the family in peace, bid farewell to the building staff and began our trek northwards to Evanston. We swung by the museum to pick up Matt on our way. The combination of the beautiful weather and our impending annual Evanston Pub Day/Peregrine Watch put us all in a very good mood. A half hour later, we were at the Celtic Knot, a pub located directly across the street from the library nest. 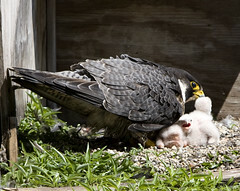 If you visit their site, you’ll notice they gave the Evanston peregrines a nice little plug! Deborah and another Evanston monitor named Dale had both taken the day off so that they could join us for Pub Day, so that was a nice surprise. The five of us ordered lunch and beers and settled in to watch the nest and chat. I highly recommend the Celtic Knot’s bangers and mashed, by the by. The Evanston adults weren’t incredibly active during lunch, so we didn’t have much in the way of new information as we finished our meal. Mary and Matt couldn’t stay, but I decided to stick around with Deborah to see what we could see. Deborah had permission from a nearby building to use a window on their 7th floor as a viewing station, so that was our first stop. The window provided an excellent line of sight directly down into the nest, so I popped the extender on our 70-200mm lens. In fact, I found most of the pictures I took with the Canon from across the street (about 7 floors up) were unusable, so I decided to fool with my digiscoping set up instead. Although most of the shots came out grainy, I did get the best shots I ever have using that system, so that’s a plus. 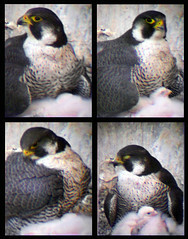 Deborah and I watched for about an hour as Nona napped with her chicks tucked beneath her. During a stretch when I had the rig off the eyepiece of my scope, she actually got up to stretch her legs and both Deborah and I could see her bands (b/g 64/D) crystal clear through the scope. Return of Nona confirmed! After awhile, Deborah and I decided to try to find the male. She took me up to the building’s roof deck and spotted him on one of his favorite perches, about 15 stories above us on the corner of a skyscraper. From our high perch, it was easy for Deborah to point out significant peregrine haunts, which I found fascinating! The male finally dove back down to the nest so we hurried back down to street level, ending up on the sidewalk outside the library. I set up equipment outside while Deborah went inside to monitor through the window. It took about an hour, but we both managed to get some quick looks at his bands before he took off again. Fortunately, I also managed to get some pictures and this morning when Mary saw them, she agreed with me that Squawker had returned to Evanston nest duty! So, I had a GREAT Pub Day and a great band collecting day! Slowly, the list of adult identifications is filling in and I’m really happy to have made some contribution that that finally! Next … Max’s bands. ~ by Steph on May 12, 2009.